This is one clubnight I've never seen in a listings magazine, but anyone with gothy predilections should be interested (if you don't know about it already.) 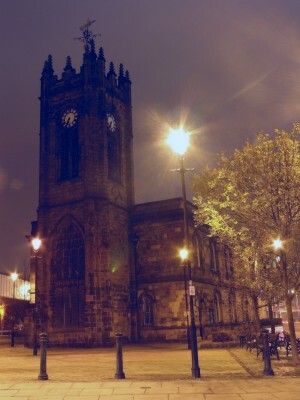 Ara is a monthly night at Sacred Trinity, a beautifully preserved gothic church on Chapel Street. Yep, a clubnight at a church. I think this is really interesting - there's nothing on the website to suggest they do any proseletyzing on the night, but there's no denying that something like this is a smart idea for a congregation interested in welcoming in a younger demographic. It's not all dancing to Bauhaus and Siouxie, though - They also have books/magazines to read, show films, have art on display and have occasional poetry readings. There's a long post on Criminally Vulgar that describes what the night is like, and also talks about a troubling series of events when the place was invaded by some drunk brawlers. If you're going, please be serious and respect the folks putting it together. The very complete and helpful Ara website will tell you everything else you might want to know (the church photo is from there). The next one is tonight, and it's an Adam Ant special. 9-2, £5, BYOB.